At YKK AP, we believe in the “Cycle of Goodness®” – the idea that “no one prospers without rendering benefit to others,” including Mother Earth. When our employee-led wellness team gathered in late 2017 to brainstorm ways to enhance the company’s wellness program, an innovative and comprehensive idea arose from Assistant Engineer, Jose Acosta. Drawing from his interest in LEED (Leadership in Energy and Environmental Design) and sustainable design, he suggested the company participate in an adopt-a-mile cleanup in YKK AP’s own backyard of Cobb County, Georgia. “I strongly believe in helping out the world because apart from everyone’s opinion, we as humans do a lot of damage to the earth,” said Acosta. 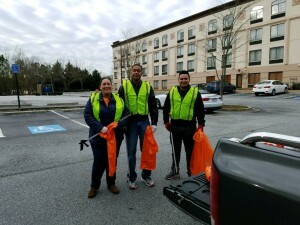 His innovative idea and leadership resulted in a company-wide participation in the Keep Cobb Beautiful Adopt-A-Mile Program, whose mission is to assist in improving the county’s environmental and waste management processes. This culminated in a successful Saturday morning event on February 2nd that accomplished a wellness goal of increasing physical activity, cultivated community among YKK AP employees, and rendered benefit to the company’s surrounding environment. As a company, we look forward to continuing to enhance the wellness of both our employees and our surrounding environment.